1) Q: One of the figures in this painting is based on a classical statue of a Roman goddess. Which one, and why do you think so? 2) Q: Imagine the figure of Judith presented frontally and symmetrically, so that the left and the right side are identical. In what ways does the figure shown in the painting deviate from a rigidly frontal, symmetrical presentation? Note that the figure is designed in such a way that each shift in position or movement is answered by a countering shift. Note that this type of complex, asymmetrically balanced pose is found in many classical statues and is denoted by the Italian word contrapposto (counterposed). 3) Q: Why do you think Renaissance artists adopted the antique device of contrapposto in their paintings and sculptures? What does contrapposto add to the figure of Judith compared with the frontal and symmetrical figure you imagined earlier? Contrapposto conveys a sense of lifelike movement; a frontal and symmetrical figure would appear rigid, frozen, or static. Contrapposto suggests three-dimensional rotation through space; a frontal and symmetrical figure would appear flatter. 4) Q: Contrapposto is an example of the classical device of antithesis, meaning opposite or contrast, which was favored in antiquity as a means of enlivening visual and rhetorical compositions. 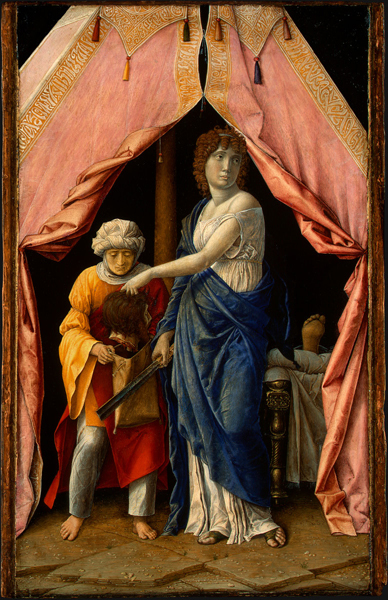 What other examples of antithesis do you see in Judith and Holofernes?